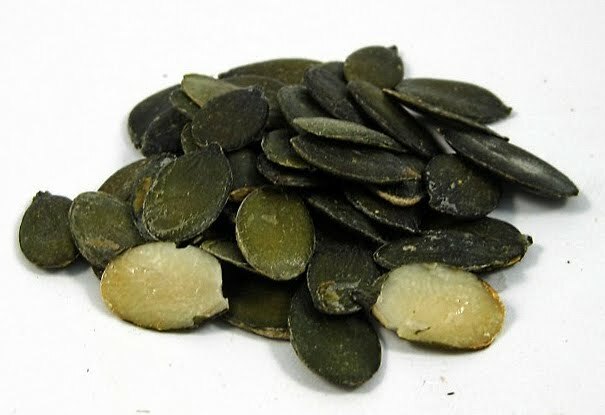 I have something coming up about pumpkin seeds and I wanted to revisit some of my pumpkin seed posts as background. Here’s a post from 2012 about a study that found men who took either pumpkin seed or saw palmetto oil had improvements in urination. The size of their prostate declined over time (improving urination even more) and they had better PSA scores. This is another randomized, double-blind, placebo-controlled trial. You don’t get better than this when studying the effectiveness of a drug. And it was long for a study like this, a year. International Prostate Symptom Scores: Symptoms in Groups B, C, and D were significantly reduced after three months. Group D showed the most improvement. Interestingly, Group D showed continual improvement over time. So, the longer they took pumpkin seed/saw palmetto, the better they felt. Serum PSA Levels: Only Group D showed a reduction in PSA levels, up to about 50%. Maximal Urinary Flow Rate: Group B was significantly increased after 3 months; Group C after 6 months. Interestingly, Group D showed no improvement, but this could have been influenced by the participants’ higher age (see comment below*). The placebo group experienced a worsening of urinary symptoms, flow rate decreased 22% over a year. Pharmaceutical drugs like Flomax are potent and can relieve symptoms overnight. Plant-based therapies (phytotherapies) can take several weeks to show effectiveness, but do so without the cost and side effects of drugs. They may also be better choices for long-term use. This entry was posted in Uncategorized on July 27, 2015 by Bix.